Dairy farms use a large amount of energy to operate due to the high power requirements of the vacuum pumps, compressors and milk vat refrigeration systems, as well as irrigation in summer. To add to the difficulties over a third of the energy used is early morning well before the sun is up. With this in mind powering a dairy farm using a solar off-grid battery system posed many challenges. Due to the difficulties faced we initially designed the system to work as a grid-connected (hybrid solar) energy storage system. Although at the time of installation a new mobile (NBN) tower was being installed on the same property which required a power connection. The existing 35+ year old grid supply to the farm was undersized and showing signs of thermal damage due to the overheating. The new grid supply was to be based on the existing supply (63A) and was also undersized especially with the additional distance to the dairy. Due to the delays with the NBN power meters and risks involved it was decided to run the system completely independent of the grid for the summer period and monitor it as winter approached. Being located in SE Victoria in a temperate climate there was a risk that it may not generate enough power to get through the short winter days. Although with some careful monitoring and slight adjustments to milking the farmer was able to power the dairy through the darkest winter days and only had to use the old (now back-up) supply for 8-10 morning milking cycles. Due to the high power demand of the milking equipment three Australian made Selectronic SP PRO inverters where chosen to power the dairy. 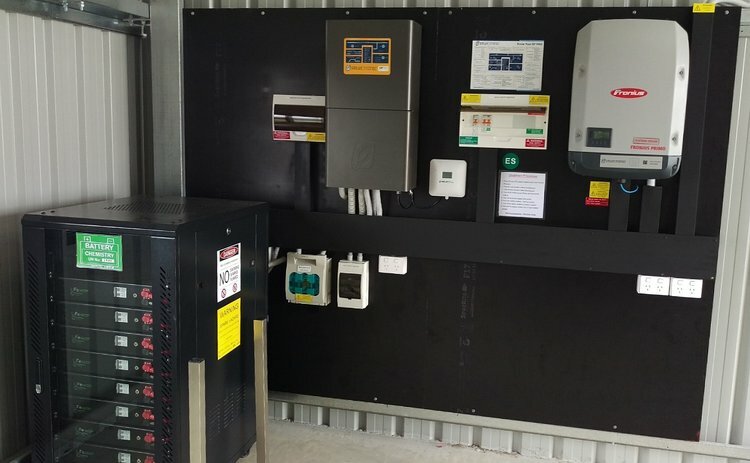 The powerful 20kW multi-mode battery inverters also function as the energy management system, with the nine ABB solar inverters being controlled by the SP PRO’s. The 240 solar panels (60kW) is designed to do the bulk of the work while the three 1kW vertical axis wind turbines assist with the battery charging. The aluminium wind turbines were an experimental design but have unfortunately had some issues with structural fatigue at the welds. Luckily the solar is performing far beyond expectations with the afternoon milking cycle being directly powered by the 22.5kW west facing and 28kW of north facing solar panels. There are also 9.5kW of east facing panels to help capture the morning sun. The early morning milking is powered completely from the energy stored in the large 240kWh Gel VRLA battery bank which has enough reserve energy for 2-3 days of bad weather. Overall the farm was powered by the system for approximately 99% of the year saving the owner around $2100-2600 per month or about $30,000 in annual electricity costs. 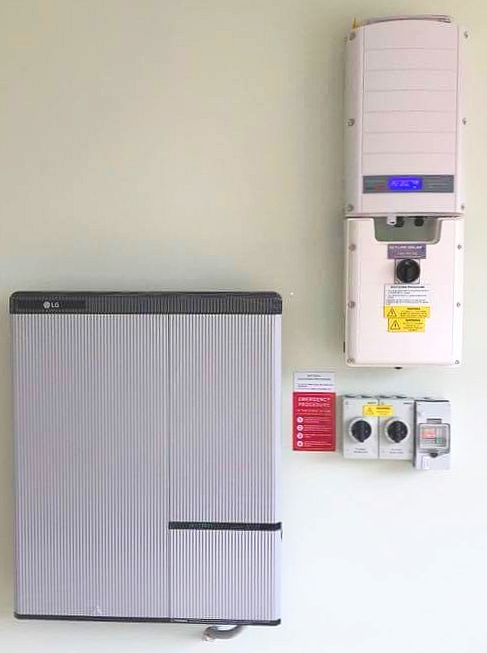 The installation was financed through a small business loan and the energy savings covering the loan repayments with an estimated payback of around 6 years, accounting for the increase in power prices. The solar panels are warranted for 10 years but most quality panels perform well for 25-35 years while the SP PRO inverters have a 10 year warranty, although with the track record of the inverters I would expected them to function for 20+ years. The batteries however due to the high power demand are not expected to last more than 10 years, although with the rapidly advancing lithium batteries and huge price reductions the cost of replacing the batteries in the future will be minimal in regard to the overall savings made. Jason Svarc works as a solar & energy storage system designer, consultant and is the technical writer for clean energy reviews.